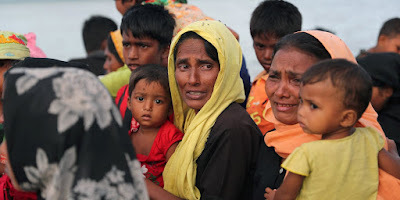 WASHINGTON — Lawmakers are demanding Myanmar’s exclusion from U.S.-led military exercises in neighboring Thailand next week amid pressure for more American sanctions in response to atrocities against Rohingya Muslims. Myanmar’s planned participation in the Cobra Gold exercise, which starts Feb. 13, comes as its security forces are accused of killing hundreds if not thousands of civilians and burning down villages after Rohingya militant attacks last summer. More than 680,000 Rohingya — loathed in majority Buddhist Myanmar and denied citizenship — have fled to Bangladesh, joining hundreds of thousands more already sheltering there. They are unlikely to return any time soon. That makes the country’s involvement in Cobra Gold, America’s largest, annual multi-nation drills in the Asia-Pacific, all the more controversial, although Myanmar has taken part before. Up to three officers from Myanmar are being invited to observe the humanitarian assistance and disaster relief portion of the drills, Pentagon spokesman Marine Lt. Col. Christopher Logan said. He said the identity and ranks of the officers participating is still under discussion. “Simply put, militaries engaged in ethnic cleansing should not be honing their skills alongside U.S. troops,” Sen. John McCain, the Republican chair of the Senate Armed Services Committee, told The Associated Press. The criticism by Democrats and Republicans in Congress reflects the souring view of the Southeast Asian nation’s transformation from decades of army rule to democracy as evidence of widespread abuses has mounted. Myanmar’s siege-like denial it’s done anything wrong has only furthered its estrangement from much of the world. Before last year’s crackdown, McCain was advocating more U.S.-Myanmar military ties, not less. Now he’s one of the sponsors of a new sanctions bill. The Trump administration already has imposed sanctions on the chief of Myanmar’s western military command and says it’s considering blacklisting others. It maintains restrictions on visas and assistance to Myanmar’s military. But the Senate’s bipartisan bill, approved Wednesday by the Foreign Relations Committee, would turn the screw by pushing for more targeted sanctions and by reinforcing restrictions on military engagement with Myanmar, also known as Burma. A partner bill has been introduced in the House. “We need to bridge the impunity gap that protects Burma’s military,” said Democratic Sen. Ed Markey of Massachusetts. Secretary of State Rex Tillerson has described the attacks on Rohingya as “ethnic cleansing.” U.N.-appointed investigator Yanghee Lee has gone further, saying it “bears the hallmarks of a genocide,” which the world body defines as acts committed with intent to destroy a national, ethnic or religious group. Unlike ethnic cleansing, genocide is a crime under international law. Rep. Ed Royce, the House Foreign Affairs Committee’s Republican chairman, and Democrat Sen. Patrick Leahy of Vermont, architect of a law prohibiting U.S. assistance to foreign military units implicated in serious human rights abuses, also said Myanmar had no business taking part in the drills in Thailand. They include 29 nations. About 20 are observers. “We should not be rewarding those who flagrantly violate international law with impunity,” Leahy said. The plight of the Rohingya has highlighted the Myanmar military’s unchallenged authority over security operations despite ceding power to a civilian government after 2015 elections. Myanmar staunchly denies that its security forces have targeted civilians in its “clearance operations” in Rakhine State on Myanmar’s west coast. Even civilian leader Aung San Suu Kyi, a Nobel peace laureate, has bristled at the international criticism. But Myanmar’s denials have appeared increasingly tenuous as horrific accounts from refugees have accumulated. Defense Secretary Jim Mattis added his voice to the U.S. criticism. Visiting Asia late last month, he said the Rohingya have suffered “a tragedy that’s worse than anything” the media have been able to portray. And yet the Pentagon sees benefits in sustaining lower-level ties with Myanmar’s military. Although the U.S. primarily engages Myanmar’s civilian leaders, it still hopes to shape the attitudes of military officers and help counter China’s strategic influence, said Murray Hiebert, a Southeast Asia expert at the Center for Strategic and International Studies. Katina Adams, a State Department spokeswoman for East Asia, said the Cobra Gold invite reflected a U.S. effort to “save lives” by improving regional coordination for disasters like Cyclone Nargis. The storm killed more than 100,000 Burmese in 2008. Thailand extended the invite, Pentagon spokesman Logan said.